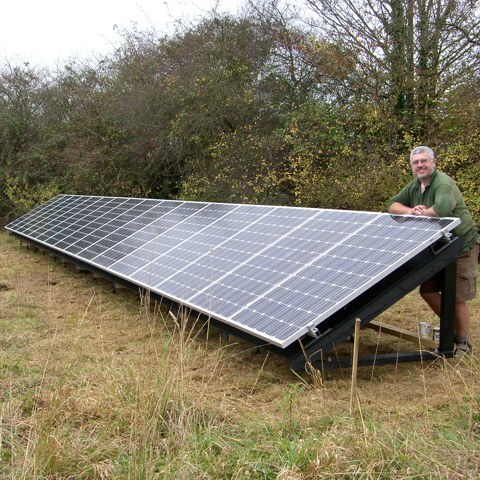 A photovoltaic panel generates electricity from light, if you have enough of them it can make a significant contribution to the amount of fossil derived energy purchased from the national grid. Eventually I would like to have a storage system which would make us more-or-less independent from the grid, but that is for another day. We live in a flint cottage (with roses round the door) and my wife was adamant that we are not having PVs on the roof. Actually, the roof is a long way from flat so it would be difficult and I do agree it would spoil the traditional look of our house so I plan to build a ground based PV array. To do so I need to build the array a fair way from the house so that it does not suffer from shading and I want to have a minimal impact on the ground. Ground based arrays have a small advantage over roof based arrays in that they tend to operate a little cooler, which increases yield and they can easily be cleaned when dust, dirt or snow accumulate. However, it is harder to locate them so they are not shaded and there is increased cost in the mounting frame.